I love Vietnamese food, especially pho. 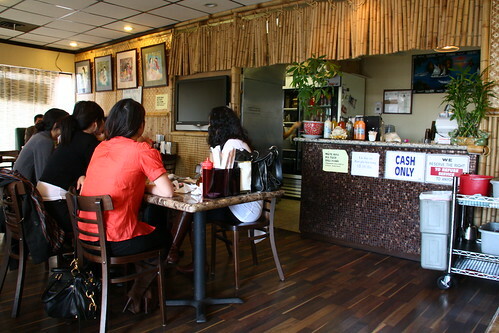 I basically have it about once a week at my favorite local Vietnamese restaurant. The waiters know my order without me having to say anything; they just ask me, “same?”, and I nod. On rare occasions I like to change it up and spice up my life a little bit, so I order a rice place or another noodle dish. The restaurant was pretty small, probably seating about 20-30 people. The menu seemed limited compared to other Vietnamese restaurants that I’ve been to. 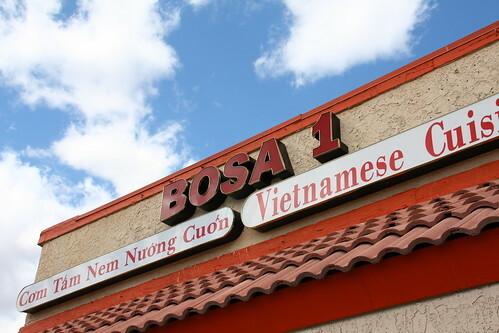 Bosa 1 is known for 2 noodle soups: Bun Bo Hue and Bun Rieu. I’ve had Bun Bo Hue before, and although I love the noodles and spicy soup, I won’t eat the pig leg/feet/knuckles. Thus, I decided to order the Bun Rieu. The most important thing of any noodle soup dish is the soup itself. 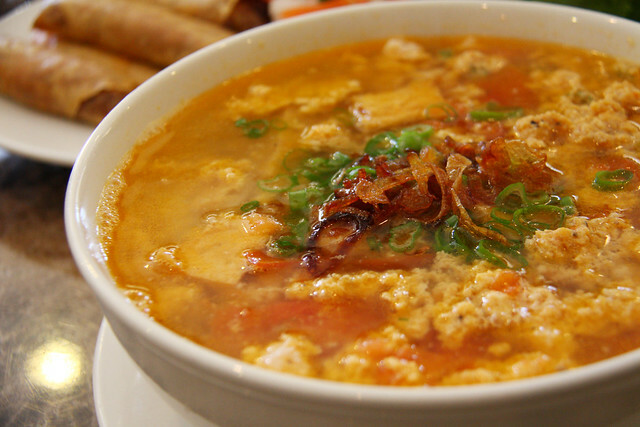 The tomato-based broth of the Bun Rieu had great flavor; I also enjoyed the fried tofu and crumbled shrimp paste. I liked this dish so much that I started ordering it at my local restaurant! 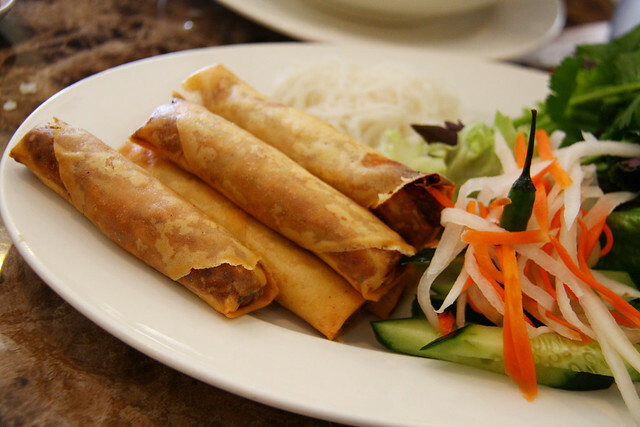 I’ve never had these kind of spring rolls before. 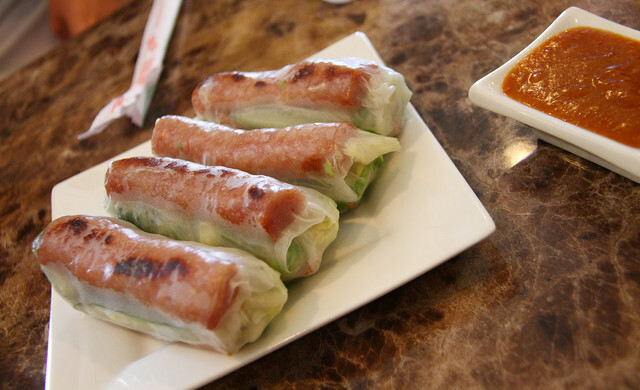 Inside each was a piece of grilled pork, lettuce/greens and fried pieces of eggroll skin (for crunch). Interesting. The eggrolls were kind of small, but I guess that was for the best since we were all stuffed from eating everything else! They tasted like I expected them to – I liked the outer crunch. All in all , a great meal at a reasonable price! The total came out to about $15 each (6 girls). 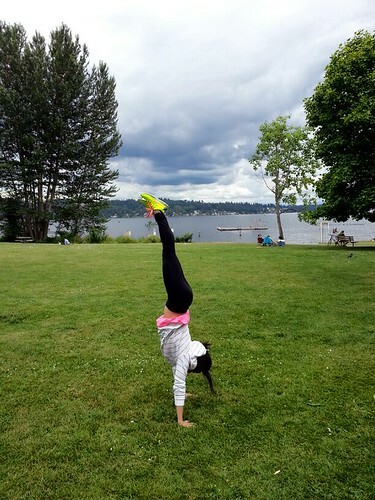 This entry was posted in these places, this girl eats and tagged bun rieu, eggrolls, pho, Vegas. Bookmark the permalink. ← …Won’t You Pack Your Bags, We’ll Leave Tonight!